Seven-month-old son Jacob Duffy, from Middleton, who was born with a series of health problems. '5th June 2015. 'Picture Jonathan Gawthorpe. Every parent thinks their newborn baby is special, but for one couple the newest addition to their family is so very precious. Before adorable seven month old Jacob Duffy was born, his parents had believed he was perfectly healthy with nothing being detected during pregnancy. But a shock was in store when on November 7 last year they discovered their bouncing baby boy had extra digits - 12 fingers and 12 toes. 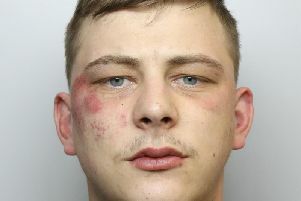 Mum Rachael Hendry, who is from the Denshaw estate in Morley before moving with partner John Duffy to their home in Middleton, said: “He is what’s known as a child with a complex syndrome. He has Coloboma, which is a rare condition and means he has underdeveloped eyes. He also has a hole in his heart and extra fingers and toes. It was heart scan that showed up the hole, which - it is hoped - will close by itself by the time he celebrates his first birthday. Jacob’s eye problems are more serious, suffering from coloboma, which affects just one in 10,000 babies, means the congenital defect doesn’t allow parts of his eyes to form properly. Doctors say it is difficult to assess how much of his sight is impaired with being so young, but will keep assessing him as he grows. To help Jacob with his development, the family, which includes his big sister Amelia, six, are fundraising to create a sensory room, which is full of equipment such as lights and wires, to help Jacob develop and play. The idea started with a friend of Rachael’s, Claire Dexter, who took on a huge challenge to raise almost £1,500 - the Tough Mudder UK course. Claire, who owns Clayton’s Herbalists in Morley, has been friends with Rachael, whose parents owned Pattison’s fruit and veg business, also in Morley Market, for years. And Claire’s efforts kick-started the fundraising for ‘Looking through Jacob’s eyes’, raising almost £1,500, with many more events being organised by friends and family in the future. It is hoped £15,000, which will help them with a loft conversion to make way for the sensory unit and the unit itself, which will be invaluable to Jacob as he grows up. A fundraising evening has been planned for August 28 at Beeston Social Club where there will be face painting, entertainment and raffles with a week in Turkey and a week in Primrose Valley up for grabs. For more information, visit Facebook page Looking through Jacob’s Eyes or email lookingthroughjacobseyes@hotmail.com.